Kid Galahad will be released on Blu-ray with a limited run of only 3000 units on August 15, 2017. The release includes as Special Features: Isolated Music & Effects Track / Original Theatrical Trailer. 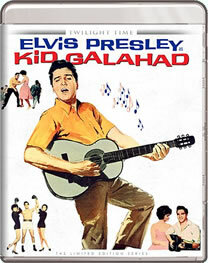 A musical version of a 1937 boxing picture, Kid Galahad (1962) stars Elvis Presley as a singing boxer managed by a cantankerous promoter (Gig Young) and guided by an amiable trainer (Charles Bronson). Joan Blackman provides the love interest, Lola Albright co-stars, and Edward Asner makes his screen début. The songs include the up-tempo 'I Got Lucky'. Limited Edition of 3,000 Units. Yes better than nothing but why won't Turner/Warner release them on Blu Ray? Nice to have in higher quality!